I need to know how to store candy covered Almonds -- as used for weddings favors. The candy covered almonds are not going to be used for 2 months.... and I have bought them... I need to know where and how to store these -- I live in a warm climate and would not want to do the wrong thing; i.e. if I was to store them in a refrigerator would that change color, and if not doing that, would the warm temperature damage them. I realize now that I should have bought them later on, but was afraid to be unable to find them when I would need them. Would appreciate your help. 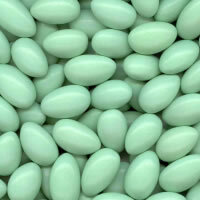 These candy covered almonds are in white, yellow, and green colors--I would not want their colors to run into each other. I suppose I could try to return them--if you think it best??? Your advice will be most appreciated. I did a little checking on how to store candy covered almonds (Jordan Almonds) for the best results and the optimum temperature is between 60-70 degrees F.
That seems to rule out the refrigerator. I wouldn't normally suggest storing the Jordan Almonds in the fridge anyway, because when you take them out, condensation is likely to build up a little on the outside and you are much more likely to have running colors just as you suspected. the refrigerator and even the freezer. If it were up to me and I had to choose one or the other, I think I'd go with the freezer. Just be sure to place the Jordan almonds in an airtight container and Wrap a towel around the outside. When you eventually remove them from the freezer, leave the towel around the container until they reach room temperature again. This should cut down on the chances of condensation build up. Is there a fairly cool place in your home where you can store the candy coated almonds in an airtight container? A pantry cupboard? Maybe you have a friend who has air conditioning and would be willing to keep the box at her house for the time being? That would be my first choice if it's an option. I hate to see you have to return them and take the chance of not being able to get them when you need them. The Jordan Almonds keep well for 3-5 months fairly easily. It's just the temperature concern I think you have to worry about. I don't know if that answer is going to be of much help. You'll still have to make up your own mind about how to store your candy covered almonds. Maybe someone else who has past experience in Jordan Almond storage will provide their opinion to help you out, too. Join in and write your own page! It's easy to do. How? Simply click here to return to Chocolate Party Favor Ideas.